Since our last report here we have whipped through several more tasks in our engine-start countdown, leaving us now with just 45 steps and 86 hours remaining. Still quite a bit, but we think we're on track for getting the engine running by no later than April 20th, or maybe the 21st, or possibly some day after that. We'll have to wait and see. 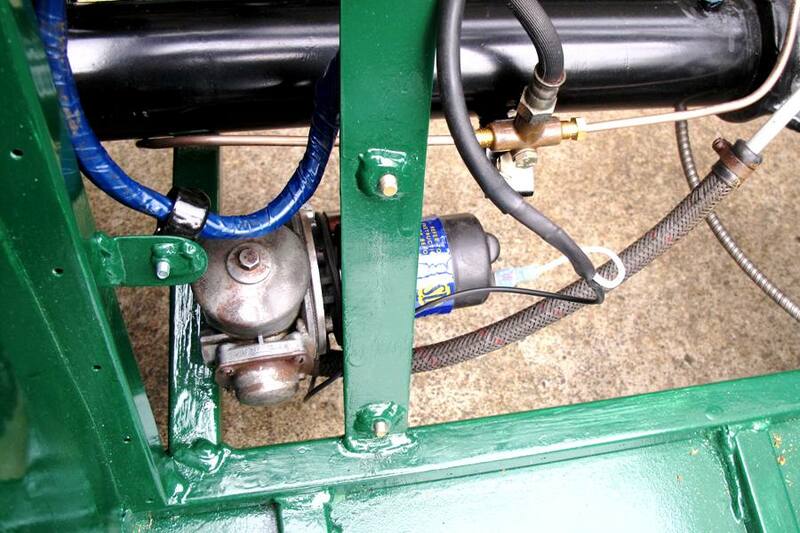 This week we installed the rear wiring harness, bolted in the front suspension cross brace, strapped in the fuel pump, installed the oil pressure gauge, and painted the scuttle for the umpteenth time. 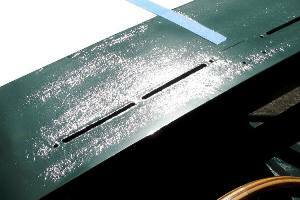 Painting the Locost scuttle has been a rough experience. We've painted about a million things over the years, and we've had issues before, but nothing like this. 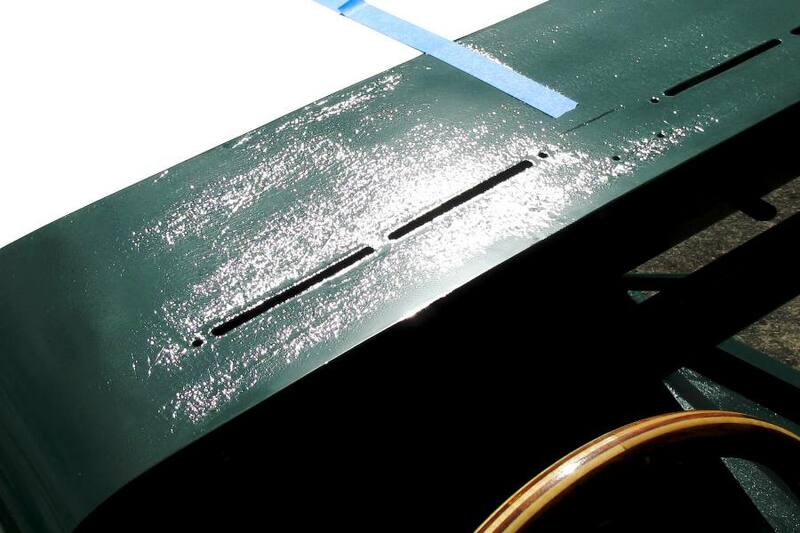 In spite of our semi-diligent prep work, each application of paint—and there have been several—has been worse than the last. I know we said we'd quit after this, but the scuttle looks too bad to give up now, so we're going to try one more time, and just to prove we're not crazy we'll to do something different this time, although we're not sure exactly what. Installing the rear wiring harness went better. 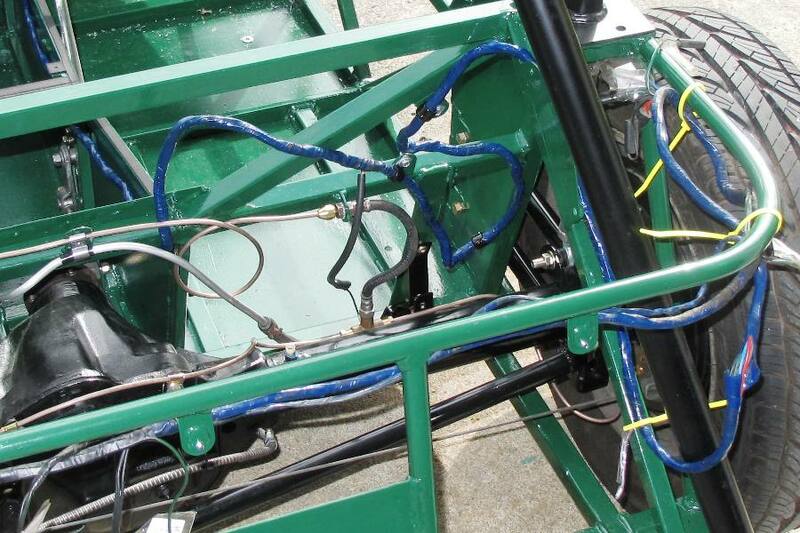 Our original routing scheme had to be modified slightly because other parts got in the way, but we were able to use all of our welded tabs so it looks like the harness is installed exactly where we planned for it to go. The harness snakes around behind the passenger bulkhead for a bit, but stays out of the way of the fuel and brake lines, which as we've noted before is important in reducing the odds of an explosion when the wiring harness suddenly bursts into flames. The only wire of any real importance in the rear harness is the one for the fuel pump, and that's all we'll be hooking up for now. Everything else is tie-wrapped to the frame until we get around to working on it. We installed the fuel pump in our modified bracket, and it still fits, although it seems to be a lot closer to everything than it did the last time we bolted it in. As long as the trailing links and Panhard rod keep things in line, we should be okay, but we'll be keeping an eye out for any scuff marks on the differential once we're up and running. We made a few more modifications to the dashboard, and managed once again to do it without ruining anything. Although we're not done yet so anything is possible. First thing we did is drill some half-inch holes for the turn signal indicators, alternator light, and high-beam indicators. We don't want to install any of the indicators yet, because it looks like they're not designed to come out, so we'll wait until the dashboard is all done and covered with whatever we end up covering it with. 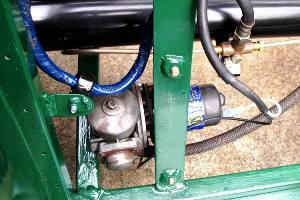 We also drilled holes for the oil pressure gauge. Most MGB gauges are clamped to the dash, but apparently that wasn't good enough for the oil gauge. 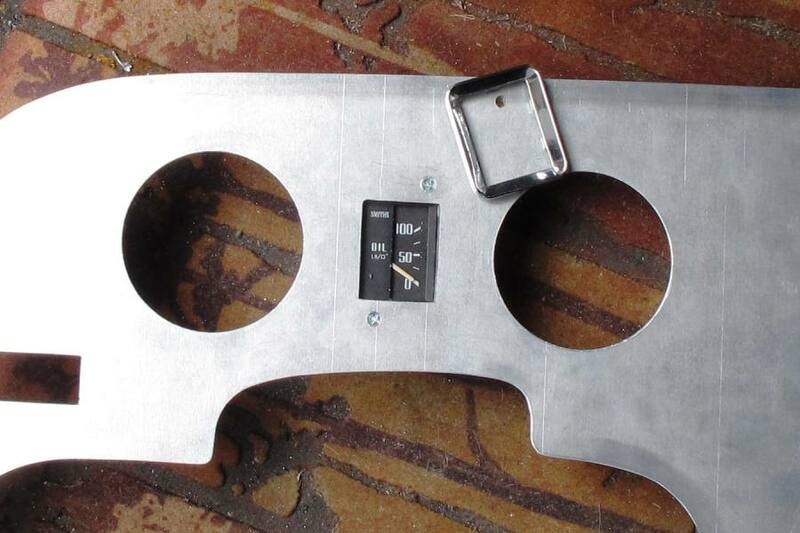 So we had to drill some holes, and they had to be perfect or else the oil gauge would be crooked. The holes in the oil pressure gauge are tiny, and the screws have to be countersunk, which means we had zero assembly tolerance. 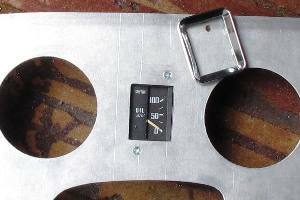 Luckily the bezel is separate from the gauge and clips onto the dash, so as long as we get the bezel straight no one should notice if the gauge is off a little. So that's it for now and the next big project on our list is installing the transmission. It fit in the car before so we're not expecting any difficulties, except for maybe finding all the mounting hardware. We'll look around and let you know. I guess finding useful, reliable inomafrtion on the internet isn't hopeless after all.